Employment Services Division Manager Alex Reichl said Community Industries Corp. has decided to step outside of its business plan. The nonprofit typically serves people with disabilities, helping them find employment, transportation, participate in activities such as shopping and exercising, and providing their families with temporary relief from care giving. The organization will add running an organic farming business to its resume when it opens Greens and Goods, which will sell microgreens, salad mixes and other organic products. 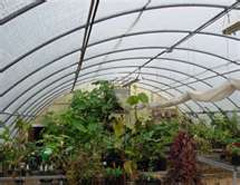 On Sept. 17, CIC staff members will work with representatives from Growing Power, a nonprofit dedicated to education and production of high-quality food, to build a hoop house — an inexpensive greenhouse heated by composting — at the location of its pallet manufacturing division, 2400 Willow Drive, Plover. “We were at a point where we were looking to expand, and we felt like this was a great opportunity,” Reichl said.